Mary Ellen Owens has given nearly 7,000 hours to Morton Plant Hospital in Clearwater. 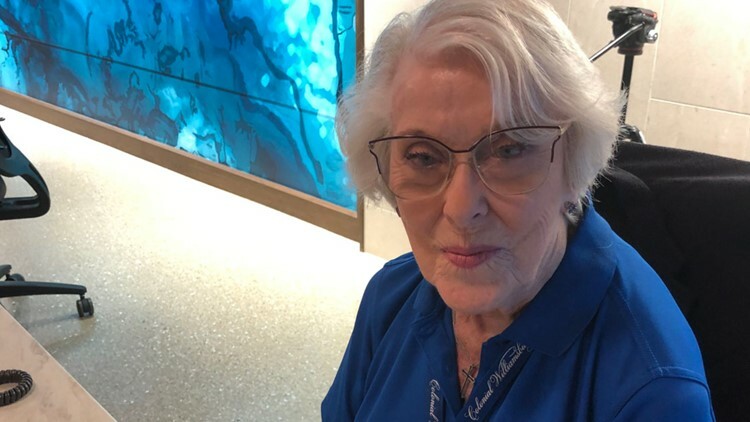 CLEARWATER, Fla. — When you walk through the doors of Morton Plant Hospital on an early Tuesday afternoon, you’ll be greeted by the reassuring voice of Mary Ellen Owens. Owens, who is now 98, started volunteering at the hospital after her husband died nearly 20 years ago. To show her gratitude, Owens wanted to give back in a big way. “I don’t have several million dollars, but I can give them my time,” she said. Owens is approaching 7,000 hours in volunteer time. In her younger years, Owens used to sashay up and down the fashion runways in New York City and Richmond, Va.
She also had an opportunity to be a part of the 1939 film classic "Gone with the Wind." Because the contract conflicted with her schedule, however, Owens decided to turn it down. “What I didn’t do in my life is more interesting than what I’ve done,’’ she laughs. Now that she’s in her golden years, Owens plans to continue to live her life with purpose by greeting each patient with a smile.